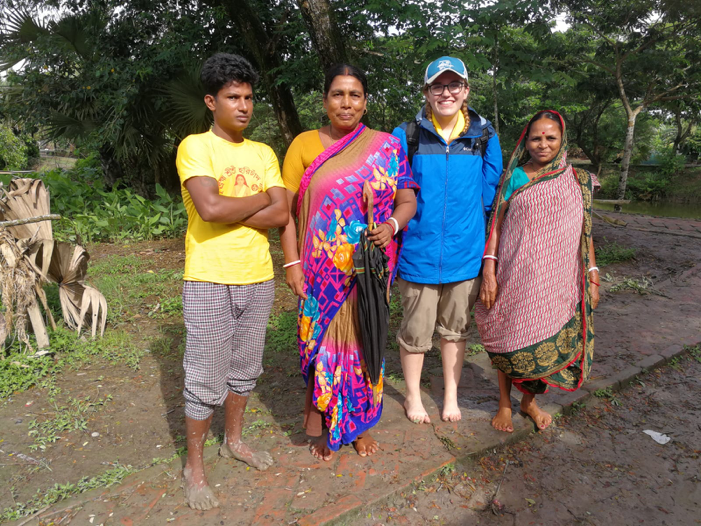 Jamie McClung is currently working on a project with Bangladesh Centre for Advanced Studies for her Master of Global Affairs i-Lab experience, focusing on women’s adaptive capacity to climate change, particularly in rural Bangladesh. 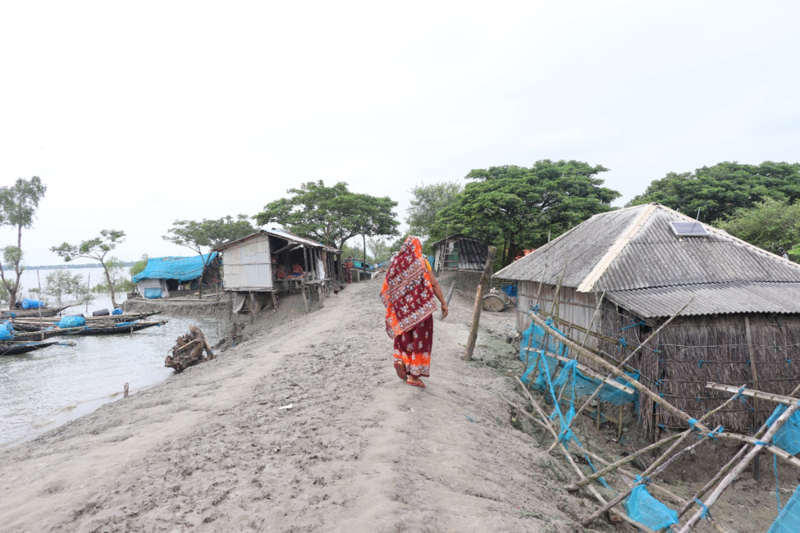 She and her partner, Chista Keramati, have just completed their first field site visit to Teknaf, in the southeast corner of Bangladesh. 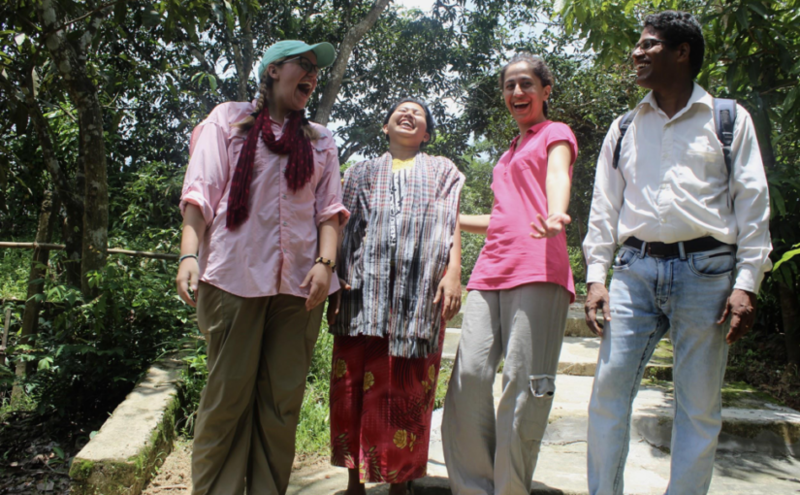 (from left to right) Jamie McClung, Ausing, Chista Keramati, and Dewan Ali Emran bond in an indigenous Rakhine village near Cox’s Bazar. It’s quite difficult to write a small blog post to describe a trip to another universe. In a few words, I’m meant to describe the surprising findings, the warmth of the people, the strange geography, the never-ending questions in my head, but how? Instead, I’ll highlight 5 aspects of our trip that were particularly meaningful or interesting to me, each accompanied by a picture. 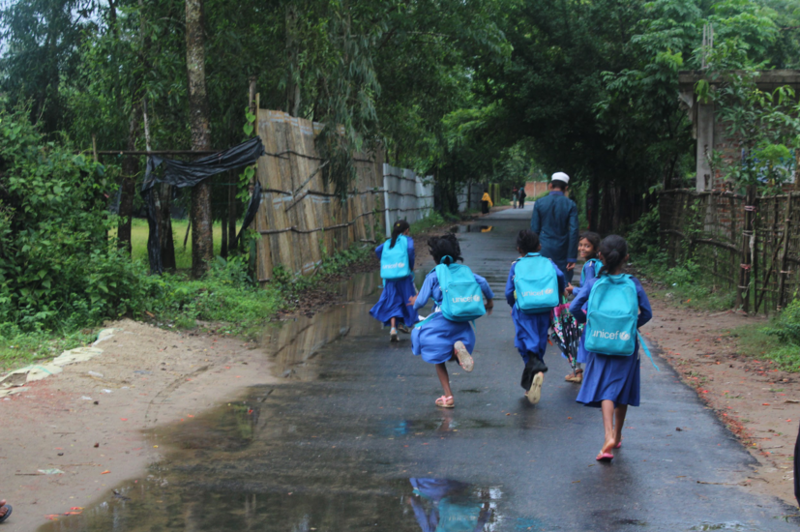 School girls in a Teknaf village walk (and run) home from school. One of the very first things I noticed was the overwhelming presence of NGOs in Teknaf—presence in terms of goods, like these UNICEF backpacks, but not in terms of people. Yes, we saw endless Land Rovers associated with different organizations on the road, but I was surprised by the lack of interaction between the people in these vehicles and the local people. I became curious about what these NGOs were doing in and around Teknaf, and if they ever stepped out of the Land Rovers. Some of my questions were answered when we met with UN Women later in the week, and I realized that they share similar goals for integral human development as we do here at the Keough School. An elderly man outside of a typical bamboo house smiles at the camera. 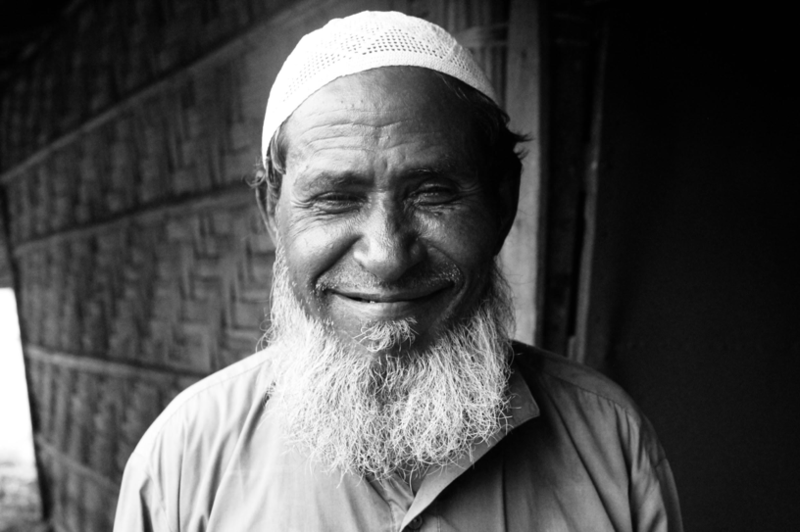 We talked with this elderly man on our first day in the village, and saw him again on the second day. He showed me that you can make a friend and communicate without any words at all. This continued to happen throughout the week, through shared smiles, laughs, and simple eye contact that conveyed a curiosity about one another and an openness to learn more. I experienced these small interactions both during focus group discussions (FGDs) and during our walks around the villages. 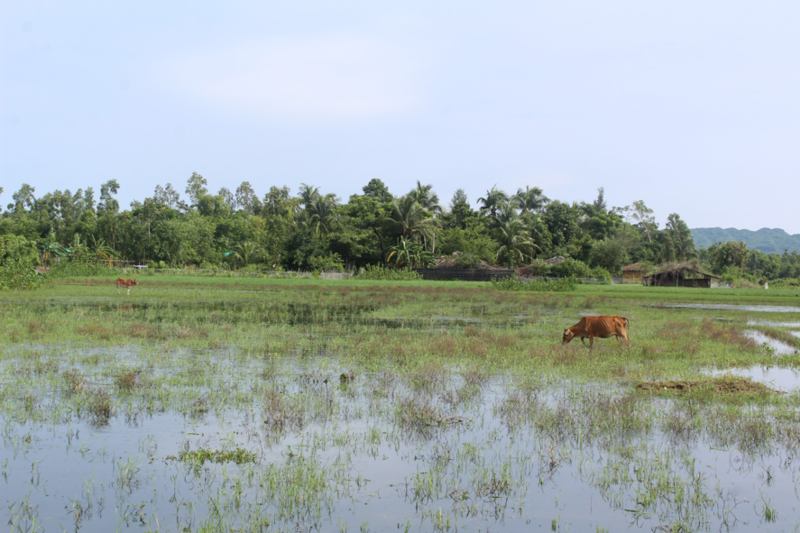 A cow grazes in a rice paddy field. This first field visit made it beyond clear why Bangladesh is so extremely vulnerable to climate change and rising sea waters. One of my thoughts when returning to Dhaka from the field was that maybe Bangladesh was the last country God created, and He just had a bit of land left, so He spread it out as much as He could, took His chances, and let water inhabit most of the space. It is low-lying, marshy, and a land covered in rivers. A young Rakhine girl poses for a photo in an indigenous village near Cox’s Bazar. To harken back to a comment I made during one of my first semesters at the Keough School of Global Affairs, I truly believe that there is no such thing as an “average” citizen of any country. This little girl, and the indigenous Buddhist Rakhine village we visited on the last day of our visit to Cox’s Bazar, reaffirmed that belief. This indigenous community had their own language, their own religious leader, and their own way of life that was extremely different than what we had experienced in the days before that. 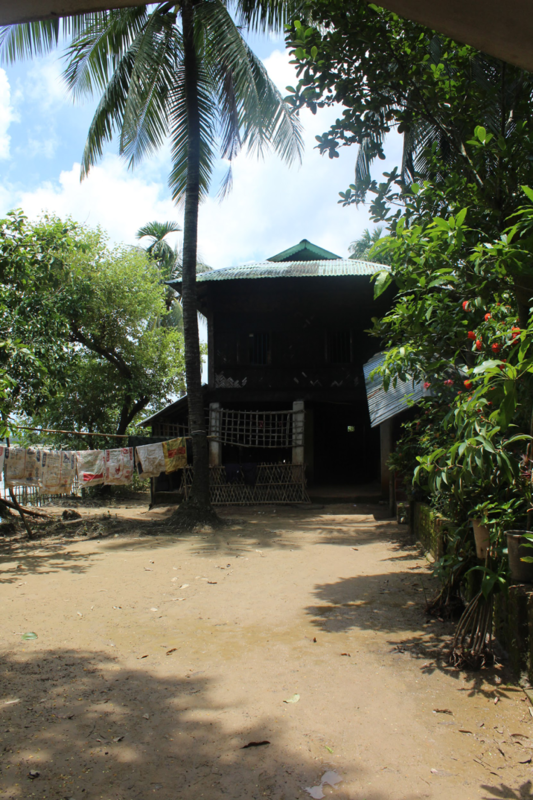 A typical house for Rakhine people near Cox’s Bazar. The final insight I had during our first field site visit was that local knowledge is already being used for adaptation, without any assistance from the outside world. This indigenous, Buddhist village has always built two-story homes with an open ground floor. It allows them to have a safe place in their home when it floods. This kind of evidence gives me hope after a week of seeing small homes built directly on the ground, unable to protect families during floods or cyclones. All in all, it was a positive week. There were times I was frustrated at how much families were struggling to survive, and how clearly the land left them vulnerable, but I was also awed by the resilience and hospitality I saw when interacting with the rural communities here. Despite being labeled as “vulnerable” by their national government and international organizations, these communities have survived and they continue to live life with or without us. This realization led me to another: development isn’t about helping people survive; it’s about accompanying them as they attempt to thrive. 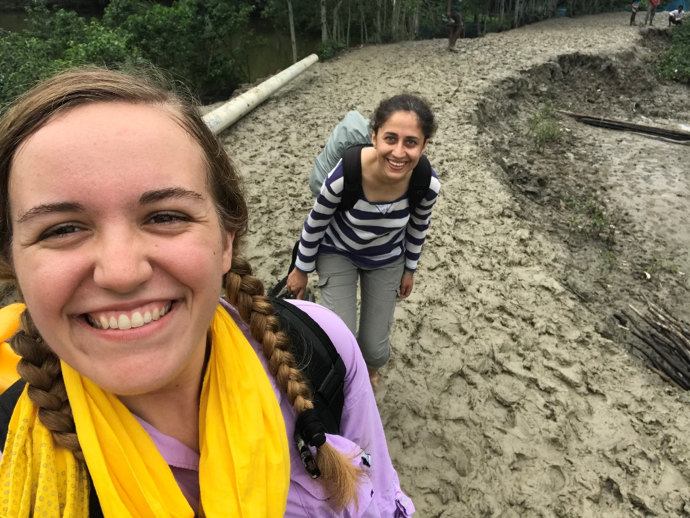 Now that we’re back in the smog of Dhaka, Chista and I are both counting down the days to our next field sites where we hope to continue bonding with and learning from the local communities we visit. 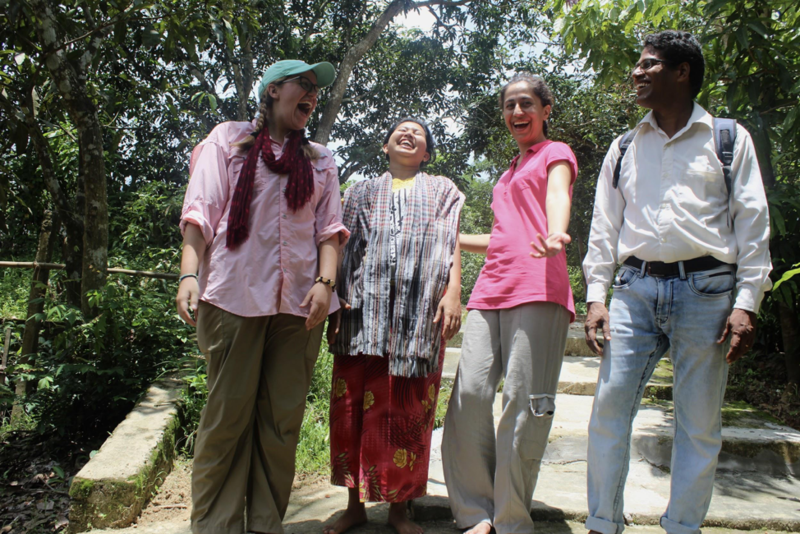 Chista Keramati is working with the Bangladesh Centre for Advanced Studies (BCAS) in Dhaka. Chista and her teammate, Jamie, will be studying the gendered aspect of climate change by looking at policies and programs in Bangladesh that address the vulnerabilities of women to climate-induced hazards. 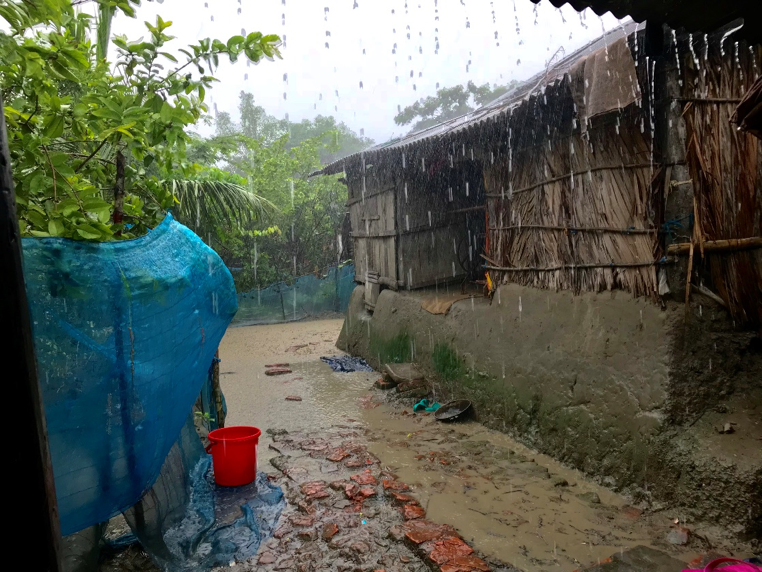 The team is conducting fieldwork in three different rural areas of Bangladesh, each prone to a different mix of climate disasters. The pilot announced that our plane would be landing in 40 minutes at Shahjalal International Airport in Dhaka. Looking out the window, I tried to see with my own eyes the Bangladesh landscape. I spotted settlements here and there, green areas of what I assumed were cultivated land, and what I initially perceived as “dirt roads.” I asked myself, “But, wait! Where is all the water that I read so much about?,” only to realize that the “dirt roads” were not really roads but rivers whose brown color comes from the huge amount of sediment they carry with them along the way. I gazed in awe at the magnificent web of rivers and wetlands that were running across the landscape below our feet. 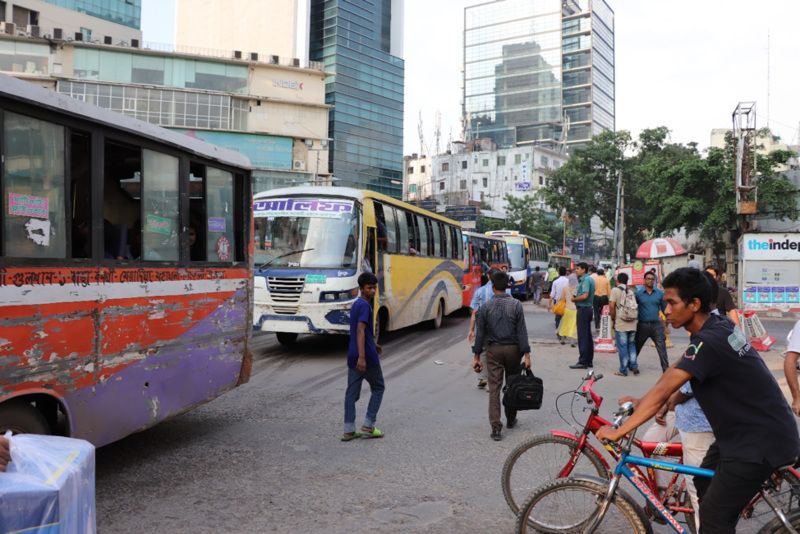 Typical busy street in Dhaka. That feeling of awe has not only remained but grown with me at every scenic or human encounter here. 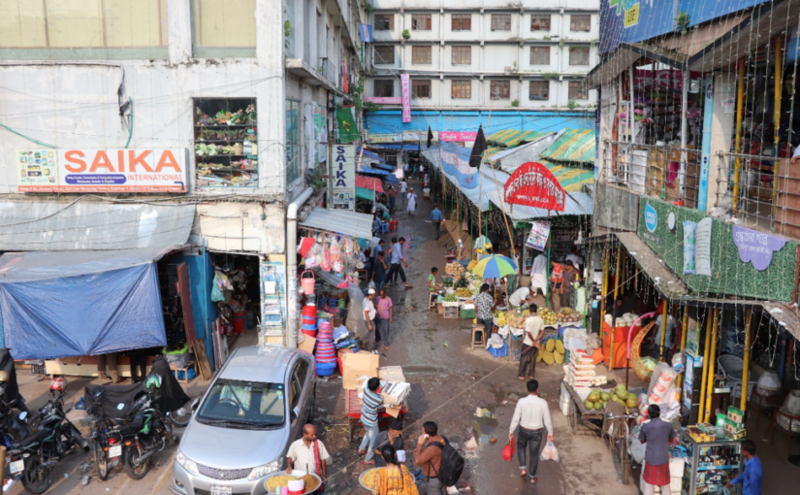 Life in Dhaka involves learning not necessarily new things, but everything in a new and different way. This new learning experience encompasses everything from the very basic activity of crossing the street (a double challenge when you are not used to people driving on the left-hand side of the road, and overcrowded streets that rarely have street signs) to working with our partner organization BCAS. 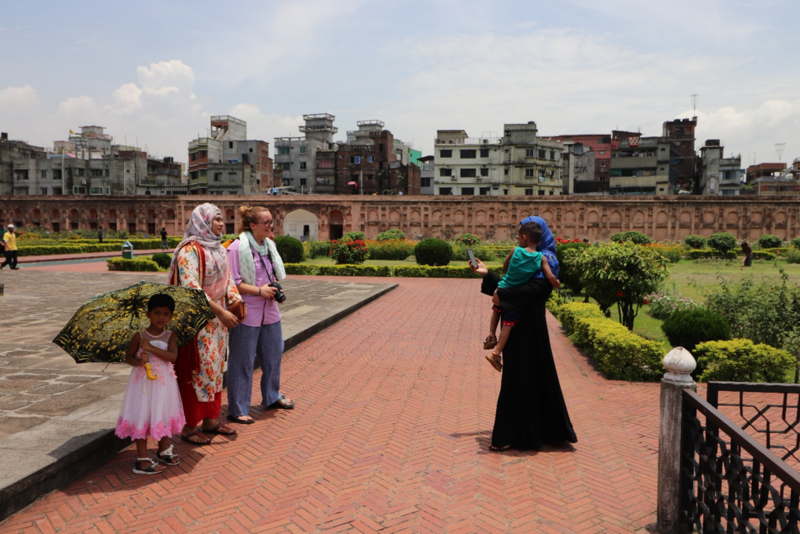 Our first week in Dhaka involved extensive meetings with BCAS members, together with our professor Tracy Kijewski-Correa. We heard about the BCAS team’s hopes and aspirations not just for a better life for the people of Bangladesh, but for the whole world. On our first meeting with Dr. Atiq Rahman, the founder of BCAS, he explained how the neat and well-organized knowledge in written reports and proposals do not necessarily match the messy realities on the ground. I can see what he means. The realities we read about on paper before coming here have felt different when faced and experienced first-hand. I am seeing with my own eyes the amount of water running across the Bangladesh landscape, and how this might relate to climate change. And instead of seeing images of busy streets, I am now crossing even the narrowest streets of Dhaka with special caution. I am relieved, too, to find that there are some female experts working at BCAS and that it is not an all-male organization. This is important to our research. 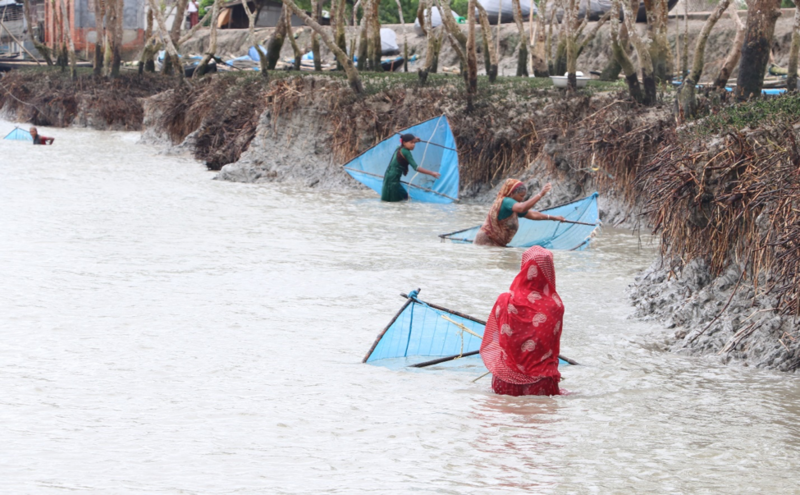 As a team of two women interested in researching the gendered aspect of climate change in Bangladesh, we are trying to observe and learn as much as we can about the attitude towards women in this country. Of course, our own personal experience has been mixed with our identity as not just women, but non-Bangladeshi women. We are slowly getting used to attracting attention at every turn in the local market, and being asked to take selfies wherever we go site-seeing. Another lesson I have learned is that Google Maps doesn’t help much with local transportation. When you are stuck in a street and don’t know how to get home, and you also don’t know the local language, you can still rely on the kindness of strangers to help you take a CNG taxi (a small motor vehicle that runs with compressed natural gas). I have learned that once you ask someone for help, they feel responsible for you until their job of helping you is completed successfully. An attraction in our own right. Kudos to the women of Bangladesh! Our team is here to learn from you all.